5 PIECE SMALL SPACE KIT! Designed with minimal storage in mind, this kit is perfect for a one bedroom apartment, dorm room or an RV. It's also a great starter kit if you're just getting into the microfiber cleaning revolution! These cloths will fit neatly into a small storage space and pack a powerful cleaning punch when you need it most. 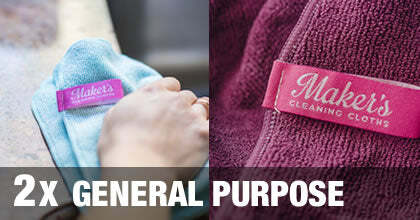 The general purpose microfiber cleaning cloth is a 16”x16”, medium weight, cloth. Perfect for dusting, spot cleaning, tackling kitchen and bathroom counters, cabinets and appliance surfaces. Includes: 2 cloths, 1x Plum & 1x Sky. 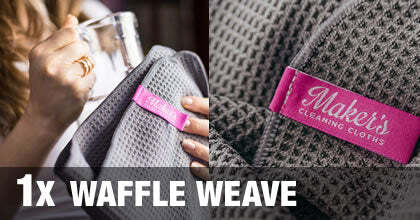 The waffle weave microfiber cleaning cloth is an extra large 24"x36" ultra absorbent and fast drying cloth making it perfect for drying dishes, floors, hands and cleaning up spills. Includes: 1 Cloth, color: Slate. 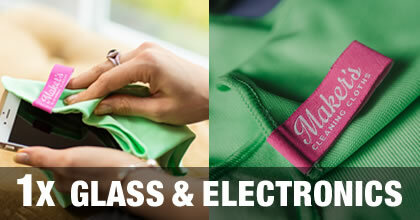 The glass & electronics cleaning cloth featuring a 16”x16” flat-weave, cleans and polishes without streaking or scratching, perfect for cleaning cell phones, laptops, tv screens, eyeglasses, mirrors and windows. Includes: 1 Cloth, color: Matcha. The ultra plush microfiber cleaning cloth is an 18”x16” ultra absorbent deep pile cloth. Polish stainless steel, chrome and leather, or clean up spills and messes—this is a perfect cloth to keep in the car or kitchen. Includes: 1 Cloth, color: Mango. Maker's Cleaning Cloths will be one of the very best cleaning tools you'll ever come across and can last for up to 500 washes if cared for properly. I've purchased many and absolutely love them! The dish towel is amazing! Whenever my friends come over they comment on how fabulous it is, so I bought a bunch and gave them to friends for Christmas. I highly recommend all the cloths. They are well worth the money. I'm somewhat of a microfiber pro and I am truly delighted by these cloths! They are so great and the sky color is beautiful! Best microfiber I've purchased in a while!